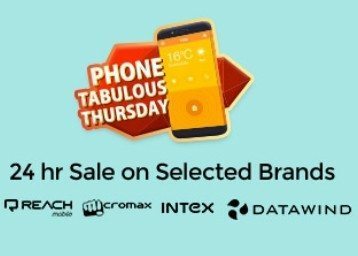 Shopclues Offering Phone Tabulous Thursday 24Hrs Sale. Here Shopclues is running 24Hrs Sale on Mobiles and Tablets, where You can get Up to 70% OFF on Micromax, Intex and more Branded Mobiles and Tablets, Starts at Rs.379. Some Easy steps here to avail this offer.